The Carmel Fire Dept. and Dementia Friends Indiana have partnered with the goal of raising awareness of the prevalence of dementia and helping educate first responders on how to recognize visual and verbal clues of dementia to better assist patients they may encounter. 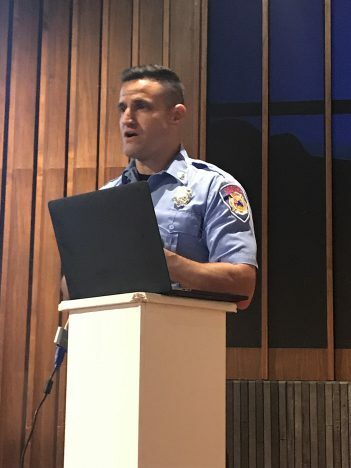 CFD firefighter Mike McNeely said the department is constantly looking for ways to provide the best service to residents. Part of a global campaign that began in the United Kingdom in 2012, the U.S. campaign is led by the National Association of Area Agencies on Aging, of which CICOA Aging & In-Home Solutions is a member. A Dementia Call to Action Day was held Sept. 14 to increase understanding about dementia and ask attendees to spread awareness of the Dementia Friends Indiana movement and to help break stigmas associated with dementia. Ziegler said because dementia is now an epidemic, no organization can address the issue alone. He recommends all sectors of the community, from health care to nonprofits to local government and faith communities, work together to build a more dementia-aware environment. To learn more or to become a dementia friend, visit dementiafriendsindiana.org.